Depending on the application for your glass, you may need to have it tempered. Tempering is a process that heats and cools the glass. After glass has been tempered, it is about 4 times stronger than annealed (not tempered) glass. It is also more scratch resistant. 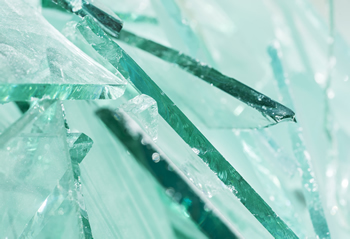 It is up to you to know if the glass you need must be tempered for a specific application (it is required by law for certain applications), but generally glass used in a hazardous location must be tempered, and glass used as a glass protector top or a glass table top does not. Here is an example of broken annealed glass. Annealed glass means it has not been tempered. Do you want your glass tempered? We leave this decision up to you. 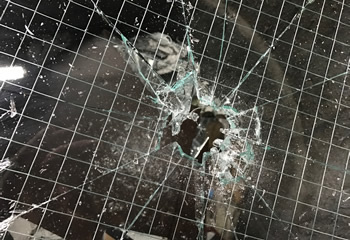 The downside of getting glass tempered is if it breaks. It will break into many very small pieces which is difficult to clean up. Also, if the glass is used as a table top and it breaks, then everything on the table can also fall and potentially break. The upside is that tempered glass is much stronger, more scratch resistant, and safer than annealed glass. It must be used in hazardous locations. Laminated glass is a safety glass. It is often used when tempered glass is not an option or in combination with tempered glass, such as, for use in sky lights. Not all glass can be tempered so if that kind of glass is going to be used in a door or other hazardous location, it must be laminated to another piece of glass, usually clear glass. 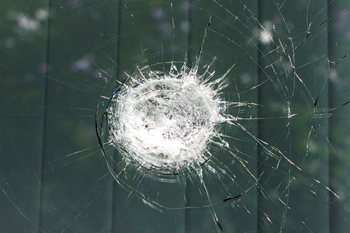 Laminated glass also works very well for security because the flexible interlayer bonds permanently to the glass. 1/4" Clear laminated glass is the most common. It uses a .030 PVC interlayer to bond two pieces of 1/8" glass together. The result is an invisible bond that is very difficult to penetrate. 1/4" White laminated glass is also very common. It uses a white interlayer: the result being a frosted translucent look. Both 1/4" White Lami and 1/4" Clear Lami are in stock at 55 Glass Los Angeles. There are different colors and thicknesses of laminated glass that can be made as special orders. Bullet resistant and glass used as floors is a combination of different thicknesses of glass and interlayer. 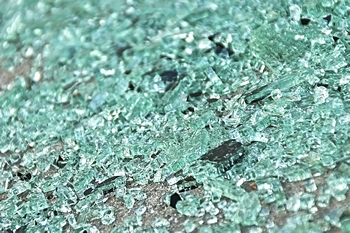 Please remember safety glass must be used in hazardous locations. Wire glass, or wired glass, is sheet glass in which wire mesh has been inserted during production. The impact resistance of this glass is similar to that of normal glass, but in case of breakage, the mesh retains the pieces of glass. This product used to be accepted as low-cost fire glass but is no longer acceptable for this use. Now, wire glass is mostly used for windows because of it exceptional security qualities. Clear wire glass and obscure wire glass are available at 55 Glass.